Two derailments occurred within a six month period in 1968, both happening on the east edge of Aspinwall. The first was in January, when 33 cars of a 90-car freight left the line, and the second was in July, when six cars of a 19-car freight derailed. No injuries were reported either time. "I was drinking coffee on a January afternoon when I heard a loud noise and looked out of my window," remembers Clara Ehrichs. "I saw train cars falling into John Meeves' pasture." Howard and Margaret Kuchel also heard the noise. "Howard had just gotten home and was having a cup of coffee. We heard this loud 'boom-boom-boom' and at the same time our boys flew downstairs; they'd seen the wreck out of the east window upstairs." 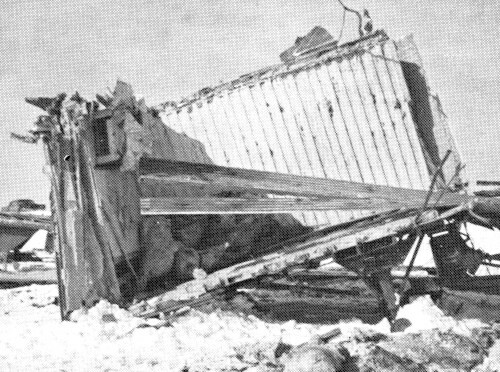 Among the wrecked cars were two flat cars carrying "piggy-back" trailers, three loaded with beef and one with lawnmowers, a load of beef hides, one of breakfast food, two carloads of potatoes, two carloads of plywood, and one with flour. Another carried onions, and Margaret remembers seeing them scattered in all directions. Much of the beef and flour was salvaged. "My husband John was at the store in Aspinwall, and I called him and told him 'a train just wrecked in your field'," Goldie Meeves said. "The next summer we had onions growing all over in the field." Clara Ehrichs said the engineer apparently didn't realize the cars had derailed as he was around the curve. "All at once he seemed to notice that he only had part of a train, so he backed up to see where the other part had gone," she said. The derailment six months later was not as bad; cargo of the derailed cars included onions and lumber, and some of the cars were empty. "We heard about it over the radio," Clara Ehrichs said. "It had happened early in the morning just beyond the curve to the east of town. We looked out our window and could just see the 'back end' of the train." In top and bottom photos, workmen are shown reloading flour and sides of beef after a train derailment in January of 1968. 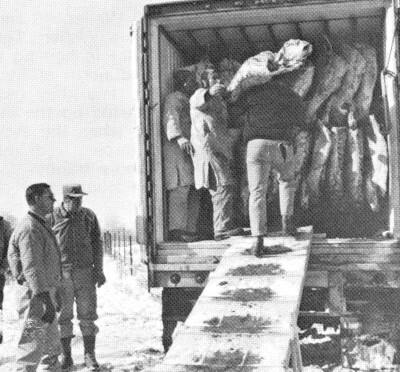 The center picture shows that only a small portion of the beef remained intact while the rest of the boxcar and beef were strewn along the tracks. 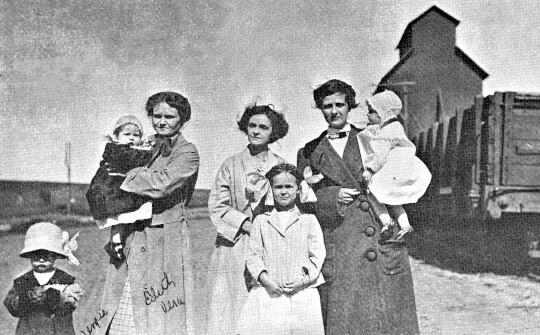 The Aspinwall Elevator and a rail car provide the background for friends Edith Case and her children Vergie and Vera, Rose Brady, and Minnie Gruhn. Mrs. Case, wife of depot agent Art Case, used the photo on a post card dated July 2, 1913. By May 1, 1882, the Chicago, Milwaukee and St. Paul Railroad had reached Dedham, a point 16 miles east of Aspinwall and 176 miles west of the starting point near Marion. The company then had in operation 4,260 miles of tracks, 527 locomotive engines, 16,740 freight cars, 207 passenger cars, 33 sleeping and parlor cars, and 135 baggage, postal, mail and express cars. During the year ending December 31, 1881, the Milwaukee carried 2,985,885 passengers, with a few more going east than west; the average mile rate was 2.86 cents. 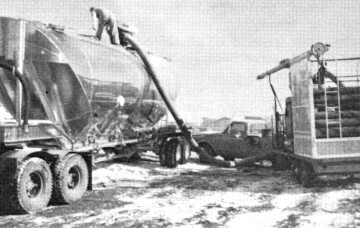 A total of 2,222,413 tons of freight was moved east and 2,053,675 tons of freight was moved west; the average mile rate was 1.7 cents. Harry and I took our children, Marilyn and Mark, to California by train in 1968. We left on the Milwaukee from Omaha at 4 a.m., traveled all day and night, and arrived the next afternoon at Anaheim; in California we visited our sons Randall, who was stationed in the Navy, and Curt, who worked in San Diego. The train ride was very enjoyable, and there weren't many stops. The round trip for all four of us cost $197. The railroad always seemed to have a problem with a bad washout of the tracks west of Aspinwall. Irene Schacht (Armentrout) and I were about 10 or 12 when we would travel by train from Aspinwall to Manning to visit our Grandma Kai and Aunt Hattie. We would leave at 8 a.m. and arrive back home in the afternoon; at Manning we would get to go uptown and shop, and we really felt we'd had a big day in town. Our train tickets cost 10c each way. This was about 1923. H.C. Martins was born in Germany and came to the United States at the age of three with his family. When he was 18 he went to West Side and worked for his brother, P.J. Martins, for a while, and then began farming in Iowa Township. H.C. later moved to Aspinwall. He helped lay the rails for the new railroad tracks; in 1888 he returned to Westside and opened a hardware business. The business has continued under the family name for more than 70 years. My father, Andrew Babik, worked for the Chicago, Milwaukee and St. Paul Railroad as a section laborer in Aspinwall. I remember the 10 hour days he put in six days a week. When I came to Iowa in 1913, they were building the double track from Chicago to Manilla. Now in 1982, no trains run through Aspinwall any longer.